Set up a 20m x 20m grid, 12 players, 3 with the a ball at their feet, 7 players with no ball and 2 players outside the grid as catchers. On Coaches call the catchers try to tag the players without the ball only. 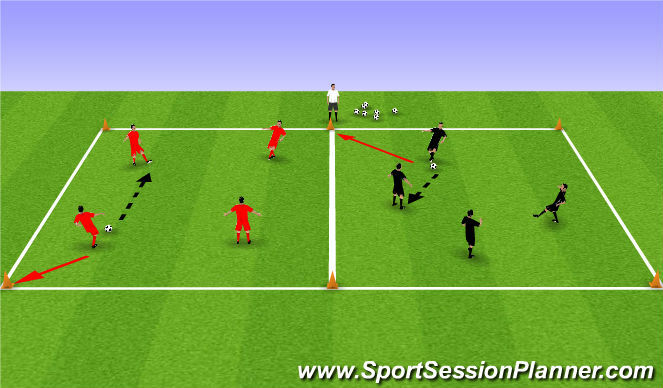 Players with the ball will pass the ball to players without without the ball to assist them not to be tagged. Ensure all players become the tagger. GAME CAN BE PLAYED WITH HANDS OR WITH FEET. 6 players in red are placed inside the the 30 x 30 area with 3 soccer balls and 6 white players are also placed inside the area with a ball each. 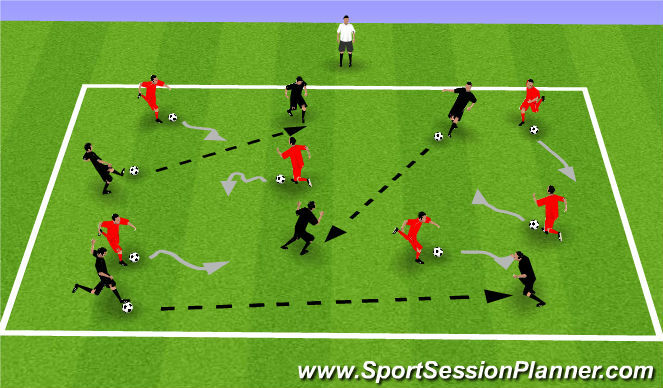 The 6 Red players pass and move within the area playing passes to only players in red while the 6 white players dribble around and change direction every 3 or 4 touches at game speed. The focus should be on the 6 players passing and moving. After 2 minutes rotate the players. Make it a competition between the red and white teams. The red team have to make as many complete passes as possible while the white team can try to intercept the passes as they dribble. The whites must still keep control of their ball. 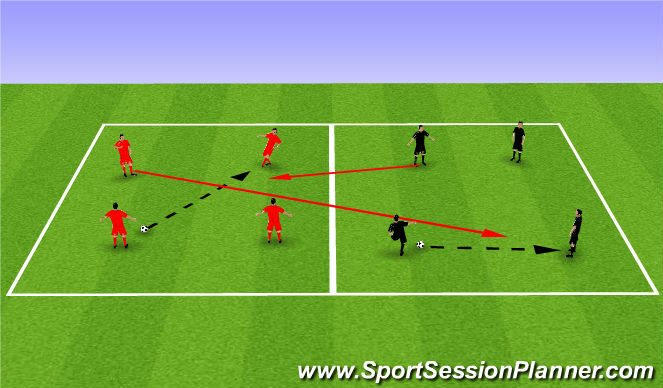 If they do intercept a pass they just stop the ball and the red players retrieve the ball and continue. Play for 2 minutes and tally the points. Rotate the players and play again. Players pass and move. Once you play a pass touch a cone nearest to you. Player must stay connected to game don&apos;t turn their back. Encourage players to take a minimum of 4 touches before passing. If the defender wins the ball or the ball leaves the grid the defender&apos;s team wins a point. If the 3 attackers keep possession for 5 passes they score 1 point, 10 passes score 2 points etc. Ensure all players get opperunity to defend. Defender defends for roughly 90 seconds. Fun activity for the team who lost. Two areas set up that are 30 x 25 with goals at each end. Players are placed in to 4 teams of 3, 2 teams per field. Players play 3v3 street ball. If the ball goes out of the field they either make the decision to pass the ball in or dribble the ball in. Encourage the players to be creative.